By Lee Shields | February 5, 2015. Thousands of Irish people took to the streets last Saturday in protest of the impending water charges. 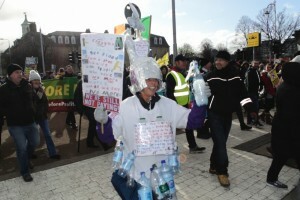 About 20 protests were happening all around the country to make it clear to the government that the Irish people refuse the water tax. The people of the Liberties also stood up to the charges, and the group Right2Water Dublin 8, organised a march for the people of the area to take part in. About 80 people gathered together at Ardee street where they marched through Meath and Thomas Streets. The march then joined up with the Crumlin, Drimnagh, Bluebell, Inchicore and Ballyfermot groups outside St.James hospital at around 1pm. These groups then met the main Southside march at Heuston Station at around half 1 and left for O’Connell Street at 2pm. The Southside march saw a huge turnout estimated to be around 10,000 protesters. The Southside march met the Northside march on O’Connell Street where the two combined to protest outside the General Post Office. The crowd was estimated at 30,000 people on O’Connell street. Protesters stayed for hours but the crowd dwindled as the day went on. The protest caused traffic restrictions and disruption to the city. It was mostly a peaceful protest, however a small crowd of protesters migrated from the main protesters and went to Leinster House. A firework was thrown at gardaí on duty inside and one protester mounted the gate to hang a small banner at the top. Others present objected and began to chant ‘peaceful protest’ and left the area.